Spring Festival & Paperback Book Sale!!! 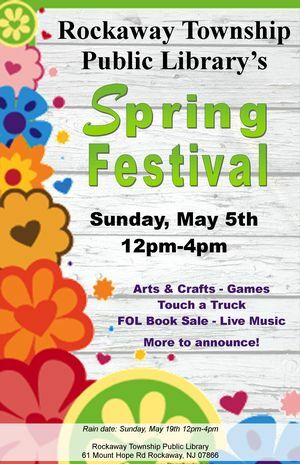 Come to the Rockaway Township library from 12-4 for arts & crafts, games, touch-a-truck, live music, Friends of the Library paperback book sale and lots more!!! ***If you would like to donate your books for the paper back book sale, please make sure they are paperbacks for adults or children and that they are in excellent condition! Rain Date: May 19th 12-4pm.